The average person gains 4lbs whilst on holiday. 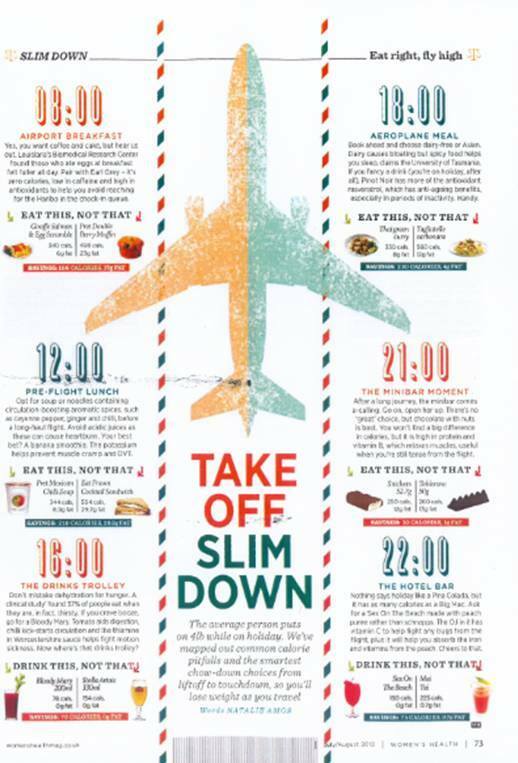 Read the July/August 2013 issue of Women’s Health Magazine UK for my top tips of what to eat when travelling. Travel comes as something of a double edged sword. Whilst you are clocking up the airmiles, it’s easy to find yourself clocking up the calories. Let’s face it, something happens when we reach the airport. We become richer (Duty Free has a lot to answer for), thinner (those great mirrors in the fitting rooms of Ted Baker) and above all, hungrier. My feature was on the cover of the Bikini Body Special of Women’s Health. And yes you can still indulge in the mini-bar!